Attending a Career Expo is a great opportunity for students to explore education options apart from traditional four-year programs, and consider other pathways towards earning a certification or degree. A career technical education (CTE) can build industry knowledge and expertise, and develop soft skills through hands-on learning and apprenticeships. A Career Expo hosts representatives from trade and vocational programs, information and technology institutes, design and art academies, culinary schools, military enlistments, and community colleges that offer associate degrees and transfer pathways to 4-year degree programs. Many post secondary options are available to satisfy each student's academic, financial and social requirements. 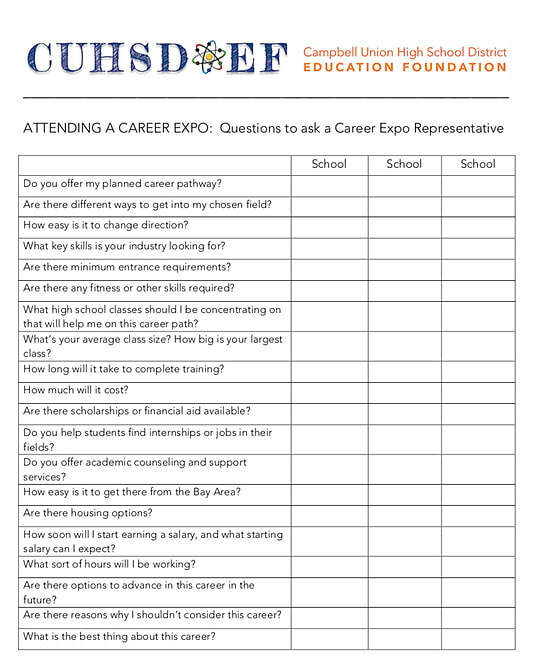 At the CUHSD Education Foundation, we hope students will use this resource page as their guide on the How to's of Attending a Career Expo. Find out which organizations will be attending and write down the names of the ones you want to learn about. If you have time, do some research, especially about organizations you have not heard of or considered before. Both students and parents are encouraged to attend, but make sure the students do most of the talking (or even go around separately from their parents.) 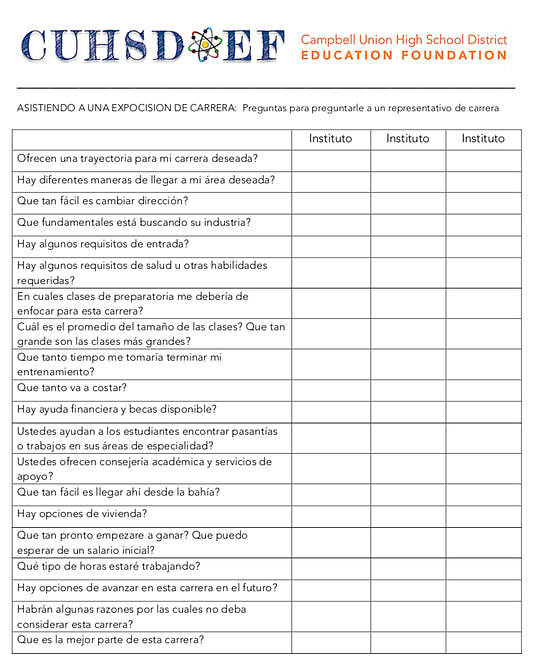 It can be helpful to get a second opinion on your impressions of particular organizations and you might ask different questions. Consider bringing a few cards/self-adhesive address labels pre-printed with your name, address, phone number, e-mail address, high school, year of graduation, interests. At the fair, save time filling out the same information at each table by giving the representative a card or sticking a label on their information card. Look at the map or survey the room and plan your route. Visit reps and ask questions. Write down your impressions and the answers you were given before you visit the next table, while your thoughts are still fresh. Ask yourself which options stood out and why. Organize the material you collected and review it while it’s fresh in your mind. Go over any notes you took during the fair. Recycle pamphlets of organizations you’ve ruled out. Do more research on those you’re thinking about. Explore websites, contact the organization, or plan a visit. If considering a particular CTE program, ask: how many students take that program; what courses you would take your first year in a particular program; and, what and how much technical training does the program offer. You should try not to ask “how good is this CTE program?” Reps will promote all programs. Students who are undecided should ask about what services and support are available to help them explore various courses of study.